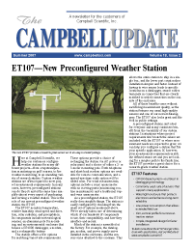 Here at Campbell Scientific, we help our customers configure weather stations for many different projects—from evapotranspiration monitoring on golf courses, to fire weather monitoring, to an unending variety of research studies. Custom weather stations are often required to meet project measurement requirements. In many cases, however, preconfigured stations can do the job and at the same time simplify almost every aspect of purchasing and owning a weather station. This is the role of our newest preconfigured weather station, the ET107. The ET107 monitors temperature, relative humidity, wind speed and direction, solar radiation, and precipitation. Its components include meteorological sensors, an aluminum pole for mounting, and an environmental enclosure that houses a CR1000 datalogger, a modem, and a rechargeable battery. The station offers a few options for matching varied site requirements. These options provide a choice of recharging the station via AC power or solar panel and a choice of either a 2- or 3-meter mounting pole. Both telephone and short-haul modem options are available for remote communication, and a spread-spectrum radio option will be added soon. For wind measurements, options include a sonic anemometer with no moving parts (minimizing routine maintenance) and a traditional cup-and-vane anemometer. As a preconfigured station, the ET107 really does simplify things. The station is easily configured by from the small set of options mentioned above. We've already taken care of determining which of our hundreds of components to use, their compatibility, and how they interface and mount. Much of the station is assembled at the factory. For example, the datalogger, modem, and power supply arrive installed in the enclosure, and the sensors come attached to the crossarm. This allows the entire station to ship in a single box, and the lower part count makes installation simpler and faster. Instead of having to wire sensor leads to specific locations on a datalogger, sensor cables terminate in connectors that are clearly matched to sealed connectors on the outside of the enclosure. All of these benefits come without sacrificing measurement quality, as the station features our usual high-quality sensors and one of our newest dataloggers. The ET107 also looks great and fits well in public settings. A preconfigured station isn’t ideal for everyone and many customers benefit from the versatility of our custom stations. In situations where project requirements don’t match the sensor set included with the ET107 or where measurement needs are expected to grow, we can help you configure a station that fits your specific application. If, however, your measurement requirements match the defined sensor set and you are looking for a simpler path to the finish line, the ET107 provides a great choice for a research-grade weather station. To learn more about the ET107 and get a brochure with specifications, visit our Web site at www.campbellsci.com/et107.